A few years ago while I was listening to bluegrass music at the Jerseytown Tavern, I listened to stories about the coal mine of Jerseytown. Several local patrons told me about their memories of the bicentennial celebrations in the summer of 1976, when they rode in a horse-pulled wagon to the site of the mine. Some people even remembered going into the mine. I left the tavern that Wednesday night wondering if this was a tall tale that locals tell as a gag, or maybe I had gotten into a bad batch of lager, or if perhaps there was indeed a coal deposit in Madison Township, Columbia County, Pennsylvania. I received my bachelors of science degree from Penn State in 1998 and had taken several classes on the geology of Pennsylvania. Nothing I had ever heard or researched indicated any coal being in the vicinity of Jerseytown, PA. My curiosity finally got the better of me in 2004 when I began exploring Madison Township history in more depth. My friend Aaron Myers and I spent an entire afternoon exploring the area North of Jerseytown, which was the site of the supposed coal mine, with no luck whatsoever. We looked for any signs that would indicate coal or a coal mine. However, we found no mine tailings (dump piles of waste rock from mines), no acid mine drainage in the water (often orange in appearance), and no signs of coal anywhere. At that point, I was convinced the story was a myth. In February 2005 I received new information from Edith Hess, of Jerseytown. She gave me several pages of information about the “Jerseytown Coal Mine” compliments of the Madison Township Historical Society. The packet of information was titled “McMichael Coal Mine Near Jerseytown” and was put together by David Nichols in 1989. It is with the help of this document that I will attempt to tell the story of the Jerseytown Coal Mine. 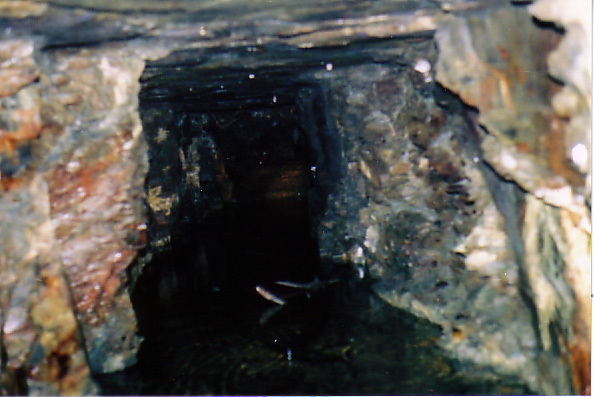 The story begins in the 1800s when wells were dug and some residents of Madison Township thought that a trace of coal was showing in the rock that was dug out of these wells. A coal company was formed and named “McMichael Coal Company.” They held their first business meeting on June 27th, 1903, in Jerseytown, PA. Interesting to note, one of the first orders of business was to issue one million shares of stock at $1 each. They decided that Huron, South Dakota would be the principal place of business transaction. It is unknown as to why this was the case. The term for this corporation was set for 20 years. At the first meeting, and after the stock was issued, the three men from South Dakota resigned; Philip Lawrence, M.H. Lawrence, and M. Hoke. In trade for 999,993 shares (out of the 1,000,000 shares created) Dr. J.E. Shuman gave the company his “right, title, interest owned by him.” This included several hundred acres owned by local persons. In other words, it appears Dr. Shuman had obtained mineral rights to mine in this area and then gave those mineral rights to the McMichael Coal Company in exchange for stock shares. The directors agreed on digging two shafts in search of coal. The shafts were dug by directors and local residents at the rate of pay of $1 for an 8-hour day. Supplies were purchased from local businessmen: lumber from P. Nick Beagle, picks and other supplies from Geo. S. Lee, and lumber and carpentry work by Cyrus Hartline. From the findings in the shaft, it was agreed upon digging a tunnel in the base of the ridge. Wm. Ivey and Wm. Holden were hired to dig a tunnel 6 feet high, five feet wide, and 15 yards long and farther if the company so ordered. They were paid $5 per lineal yard. The company furnished the explosive powder and fuses, the timber props, and material for track. Ivey and Holden were responsible for installing a car and buggy. Work was to begin within 10 days of the June 27th, 1903, meeting. It was also agreed that if Mr. Ivey or Mr. Holden revealed anything to any persons, other than the McMichael Coal Company, or if they failed to drive the tunnel the required 15 yards they would forfeit all pay due. This brings us to present times. I was now convinced that indeed there was deposit of coal in the Jerseytown area. I figured it was either the far west reach of the Wyoming valley anthracite deposit, or perhaps an island of bituminous or lignite as seen in Sullivan County. This feeling of confidence continued until February 2005 when I located the site of the McMichael “Coal” mine for myself. Upon extensive exploration and study I have not found even one piece of evidence that the mine produced anything other than very dark slate. 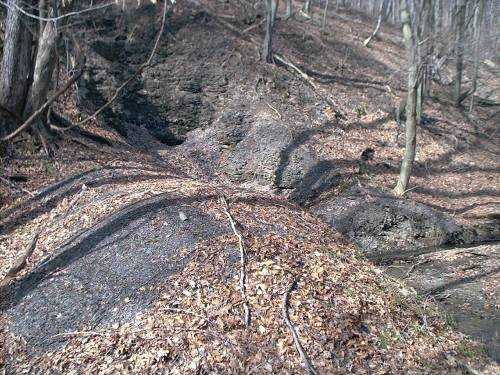 In addition, the US Geological Survey classified the surface geology of that portion of Madison Township as part of the Hamilton Formation, which does not contain coal deposits. * Granted I am not a trained, professional geologist. However, I did work for some time as an underground coal miner in Schuylkill County PA. I have explored coal workings all over the state. In addition I now teach high school environmental science and am constantly working with coal in the classroom. I can certainly understand how people might have mistaken this black siltstone as possible coal, but in my opinion it does not and never did burn. The Danville News (May 13, 1980) reported “the mine never produced good anthracite, but rather a slaggy, but burnable material that formed large fused clinkers rather than fine ash.” I disagree with the claim that this substance burned at all since is a siltstone, not coal. 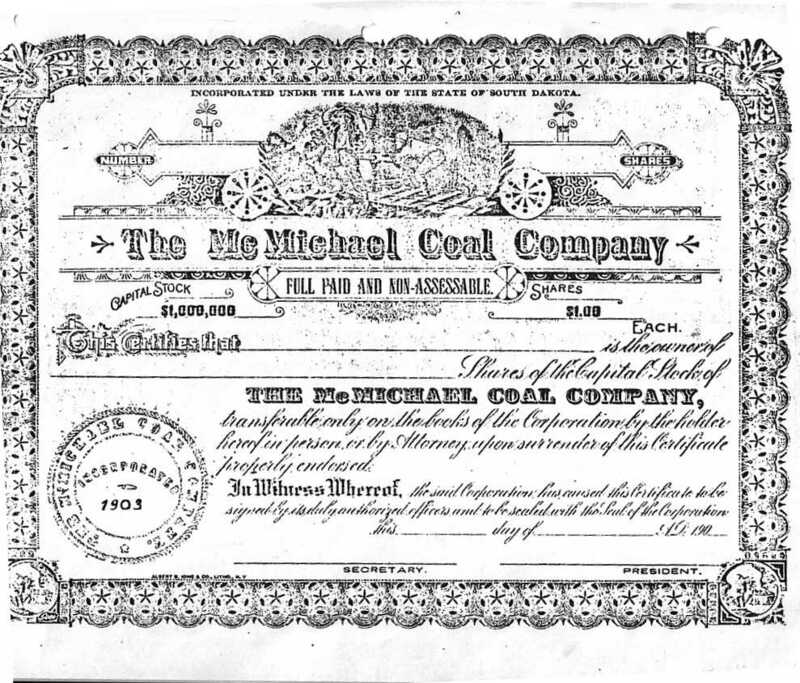 During my research, I did hear some stories that the McMichael Coal company may have “salted” the mine, or imported coal from an outside source and claimed it as coal from their mine. This has not been confirmed at this point. Was there a “Jerseytown Coal Mine?” Yes. How much coal did it produce? In my opinion it never produced even a tablespoon of coal. Although one million dollars of stock were issued in 1903, it doesn’t appear that this was a racket scheme. Local people did have good reason to believe that a coal deposit may have been found in Madison Township. There is coal to the North, East, South, and even west if you travel far enough. I imagine there would have been great excitement in the area as speculation and rumors circulated. At this time in American history, coal was at the headlines of every paper. The Great Anthracite Coal strike had just brought the nation to its knees in 1902. The nation was starved of its primary fuel source for 160 days until the strike was resolved only after president Theodore Roosevelt intervened. Under the circumstances, there was a tremendous demand for coal. The Jerseytown “coal” almost certainly had people very excited and even relived. Better off or worse off? In the year 2005, let us ask ourselves which would have been better; if coal had been found in Jerseytown or not. At one time coal brought a financial boom to many rural areas of Pennsylvania. However, many of these towns today are left with hard economic conditions and often environmental catastrophes. What were once streams teaming with native trout are now toxic rivers of acid mine drainage. Mountains which supported diverse Appalachian ecosystems are now covered in thousands of acres of acidic culm waste. Mining practices of 1800s and early 1900s have taken a terrible toll on the health of our people and places. Today Jerseytown is a beautiful picturesque scene of rolling fields and forests. Some of the best fishing and hunting can be found in these parts. Perhaps we should be thankful that all the McMichael “Coal” Mine ever produced was shiny black siltstone. Instead of hills of coal waste, today we are left with something more valuable, a beautiful community with an amazing history. 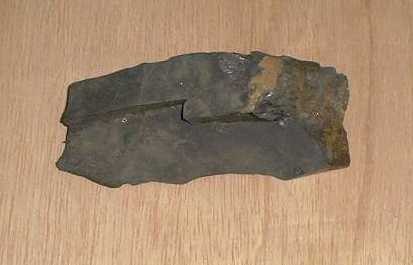 Sample of rock mined from McMichael Mine. Note the shiny black portions that resemble coal. The location of the McMichael Mine is in Pennsylvania State Game Lands 226 near Chuck's Archery. From Route 44 travel West of Jerseytown. Turn right onto Swartz Road. In about a half mile or so, you will come to an intersection, with a road coming in from the right, a road dropping steeply to the left and a road in front of you. Go straight, in less than a half mile, when the road branches, stay left of the farm. Head for the signs that indicate State Game Lands and/or Chuck's Archery. This is Coal Mine Road. The parking area is about a quarter mile down the road. From parking lot, travel on foot about 200 yards. Take a left onto a wagon road that travels down and crosses the creek. Now follow the creek upstream about 200 yards (no trail.) The mine tunnel will be on the left shore of the creek. The mine is no longer open. However you can see the mine tailing (dump piles) next to the creek where the mine entrance used to be. Please keep in mind you are on State Game lands. Please be safe and respectful. From: A geological hand atlas of the sixty-seven counties of Pennsylvania: embodying the results of the fieldwork of the survey, from 1874 to 1884. By J. P. Lesley. (Report of progress (Geological Survey of Pennsylvania), v. X ) Harrisburg, PA : Board of commissioners for the second geological survey, 1885.